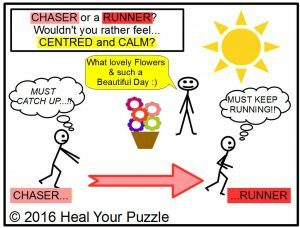 Heal Your Puzzle » Blog Archive » Centred with Inner Peace or Chasing Your Tail? Centred with Inner Peace or Chasing Your Tail? Why is Inner Peace so Elusive? Becoming Centred requires that you can manage all the interactions between yourself and your surroundings in a way that keeps you empowered and able to respond in the moment in a way that is constructive and positive for all involved. It is a skill. It requires the ability to think clearly in the moment, assessing very quickly all the factors and coming to a conclusion about what to do next. It requires understanding about yourself, about the circumstances, about the other people involved and how to be part of bringing all that together and move forward.